Heat oven to 325°F. Wrap outside of 9-inch springform pan with foil to prevent leaking. Spray inside bottom and side of pan with cooking spray. In small bowl, mix crust ingredients. Press crust mixture on bottom and 1 inch up sides of pan. Bake crust 6 to 8 minutes or until set. In large bowl, beat cream cheese with electric mixer on medium speed until fluffy. Gradually beat in sugar until smooth. Beat in eggs, one at a time, just until blended. On low, beat in whipping cream, flour and vanilla until smooth. Pour over crust. Bake 1 hour to 1 hour 10 minutes or until edge of cheesecake is set at least 2 inches from edge of pan but center of cheesecake still jiggles slightly when moved. Run small metal spatula around edge of pan to loosen cheesecake. Turn oven off; open oven door at least 4 inches. Let cheesecake remain in oven 30 minutes. Cool in pan on cooling rack 30 minutes. Refrigerate at least 8 hours or overnight before serving. Just before serving, run metal spatula around edge of pan; carefully remove foil and side of pan. In medium bowl, mix together strawberries and glaze. Arrange strawberries on top of cheesecake. 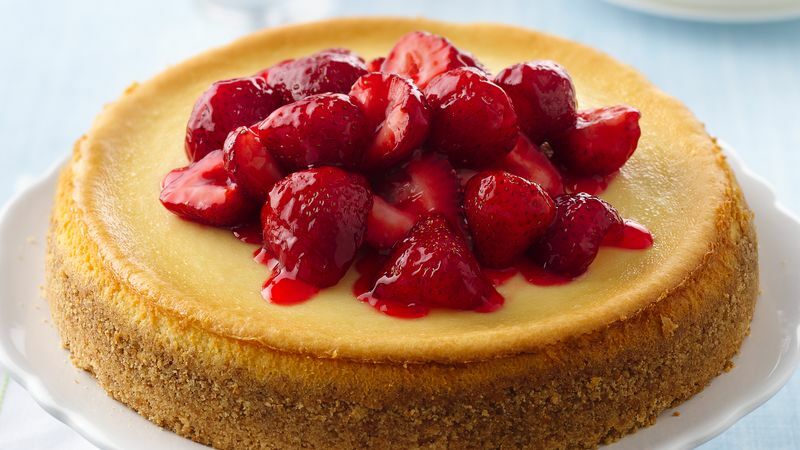 If using frozen strawberries, allow strawberries to thaw and come to room temperature before making cheesecake. When making any cheesecake, be sure to have the cream cheese, eggs and other ingredients at room temperature. Use full-fat cream cheese for the best flavor and texture. Reduced-fat varieties will result in a softer, more watery cheesecake.